My week was a really great one book wise, how about you? SYNOPSIS: This eloquent novel explores Queen Elizabeth's life as a child and teenager, opening just before Henry VIII dies and ending when she is nearly 20. Growing up in the shadow of her mother, Anne Boleyn, young Princess Elizabeth has become adept at dodging the constant political games and royal whims that ensure her situation is never secure. 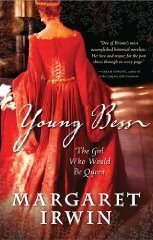 When her distant father, tyrannical King Henry VIII, dies, the future brightens for Elizabeth. She is taken in by Henry's last wife, Katherine Parr, whose new husband is Tom Seymour, the uncle of Elizabeth's brother, the new king. Seymour, however, is playing a risky game. Marrying a widowed queen is one thing, flirting with the king's daughter and second in line to the throne is another. As the adolescent Elizabeth finds herself dangerously attracted to him, tragedy looms ahead for her and her kingdom, and she is forced to face her future alone. 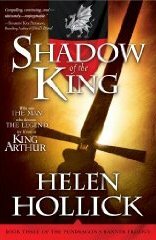 SYNOPSIS: The final book in the most historically accurate Arthurian legend trilogy, The Shadow of the King is not just a wrap-up novel, but an engrossing story of its own. Although Britain lies in an uneasy peace, Arthur Pendragon, King of Britain, sets sail for Gaul to defend territories there—leaving his country vulnerable and leaderless. When word comes that the Pendragon has fallen in battle, the powerful Council, headed by Arthur's power-hungry uncle, threatens to overthrow Gwenhwyfar and her young daughter. Gwenhwyfar is also opposed by Arthur's ambitious ex-wife Winifred, keen to advance her own son as rightful heir. But, unknown to Gwenhywfar, events abroad mean a far mightier battle for the Pendragon throne—and for the very future of Britain itself. SYNOPSIS: The heroines of Lauren Willig's bestselling Pink Carnation series have engaged in espionage all over nineteenth-century Europe. In the sixth stand-alone volume, our fair English heroine travels to India, where she finds freedom-and risk-more exciting than she ever imagined. SYNOPSIS: As historical records show, Anne Whateley of Temple Grafton was betrothed to William Shakespeare just days before he was forced to wed the pregnant Anne Hathaway. Here, Anne Whateley takes up her pen to tell the intimate story of her daring life with Will. Obliged to acknowledge Will's publicly sanctioned marriage, Anne Whateley nevertheless follows him from rural Stratford-Upon-Avon to teeming London, where they honor their secret union, the coming together of two passionate souls. Persecution and plague, insurrection and inferno, friends and foes all play parts in Anne's lively tale. Spanning half a century of Elizabethan and Jacobean history, and sweeping from the lowest reaches of society to the royal court, this richly textured novel tells the real story of Shakespeare in love. SYNOPSIS: Between the years 1630-1668, the French gem merchant, Jean Baptiste Tavernier made six voyages to Persia and India. His true exploits by land and sea go far beyond the ink and paper exploits of fictional adventurers. Tavernier met and did business with some of the world's most powerful princes and romanced some of the most beautiful women. Sometime during his later voyages, Tavernier acquired a magnificent 116 carat blue diamond. Upon his return to France, he sold the diamond to Louis XIV, for the equivalent of 147 kilos of pure gold. The Sun King made him Baron of Aubonne. 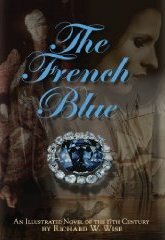 The remains of Tavernier s blue gem is known today as the Hope Diamond, but for the first 200 years of its history it was called simply The French Blue. Buy at PTTP's Amazon Store. Drool, covet, lust..what more can I say? Great books and I am pea green with envy. Enjoy Miss Amy. Well, you're right, your post is leading to envy! Although I also received Young Bess and Shadow of the King, I would kill for a copy of The Blood Lilly!! Care to share your contact at Dutton? I haven't read any in the pink carnation series, but I have picked it up at the bookstore several times. Also, the french blue sounds very interesting. 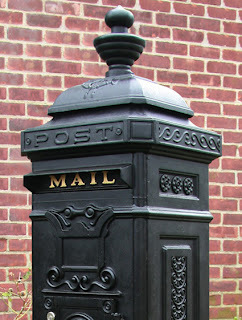 Nice mailbox week, and my family thinks I'm crazy for wanting to check the mail! You did make a haul this week! They look good. 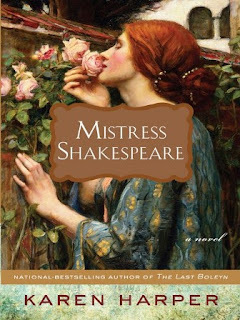 I just love the cover for Mistress Shakespeare! I'm so behind on my Lauren Willig books, I still haven't read "Temptation of the Night Jasmine". Great books in the mail, they've all got such great covers! I got four in the mail today. I haven't read the fifth book in the Pink Carnation series yet either! Must get onto that! 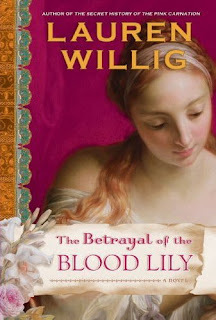 The Betrayal of the Blood Lily sounds especially good. Enjoy your new books!